Suddenly now I understand, this is why kids fear to brush their teeth to this day. Soap in the toothpaste! But here we have Listerine selling us their revolutionary new soapless tooth powder. "Omitting soap permits the use of cleansers 100% costlier... more effective." Wait, what? You know I think even the ad designer was having issues with trying to market this product. Maybe he liked the soap in his tooth power, the world will never know. At any rate you can only imagine how vile the stuff must have tasted. I know when I was younger mom would make me brush with baking soda once a week. I effing hated it and wanted to shove the toothbrush up somewhere unfriendly so I can only imagine how even this stuff must have tasted and it was soapless. The ad further takes us down the merry path of of introducing a friendly new ingredient. Dear God in heaven! I've been waiting for this because I've been scared of those unfriendly ingredients for years. So what is this ingredient you ask? I'm going to guess Fluoride because the ad never tells us. It's a trade secret and loose lips sink ships don't ya know? They certainly packaged it into a bargain can, one that lasted the user for 3 whole months. I don't know why they bothered so much, most people back then lost their teeth early. Both my mom's parents had dentures by the time they were 19 and it wasn't from lack of brushing... or maybe it was who knows? I still can't get over the whole soap thing in the tooth powder. Maybe I should just wet my brush and give it a few swipes over the bar of lifebuoy before attending to the old choppers? 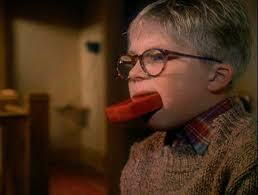 Of course I think Ralphie would have a few words to say to that... "Oh Fudge!"